So if you follow me on Twitter you'll know it was my mum's birthday on the 13th October and it's now a tradition to make a birthday cake on someone's birthday instead of going to the shop to buy one already made. We started this tradition off when I really wanted a cake for my birthday which was surrounded in KitKats and the top was covered in chocolate M&M's and ever since we have made a birthday cake on everyone's birthday in what ever style they would like it to be. This year I wanted to make a birthday cake for my mum which was covered in piped roses but only on half of the cake. The rest of the cake would then be covered in frosting, but smoothed all the way round with piping going around the top of the cake. However, I had a slight dilemma with icing and no matter how many times myself and my mum tried to make the frosting in our stand mixer, it refused to work out so we ended up with only a little bit of icing and I didn't have enough to ice the cake and then pipe roses on. I was absolutely gutted! However, I did have enough frosting to crumb coat the cake so I had the option of covering the cake with fondant icing instead once I had crumb coated it and left in the fridge to cool. After having a very stressful two days while making this cake and another (which I am going to be featuring on my blog), I am so pleased with the outcome and I can't believe I was able to create a cake with fondant which looked absolutely perfect! No cracks, no holes, and no splitting! The fondant was made to the perfect thickness to move onto a cake and then smooth out without it going terribly wrong and last time I used fondant, it was a complete disaster! 10 Points to myself for the effort I put into this cake for my mum. If you'd like to create this cake then carry on reading for the Recipe! In a jug measure out 250ml of recently boiled water. Place the jug onto your scales and add 50g cocoa powder and 100g of dark brown sugar. Mix this together until it is smooth and has no lumps! In a small bowl sift together 225g plain flour, 1/2tsp baking powder and 1/2tsp of bicarbonate of soda so there's no lumps. On a stand mixer (or in my case, a large bowl and a electric hand whisk) whisk 125g butter and 150g of sugar together until pale and fluffy. Then add your 2tsp vanilla extract. Whisk and add your two eggs and then whisk again until incorporated. Alternatively add in your dry ingredients and then the liquid in three additions, mixing in between so everything is incorporated! Pour evenly into two lined 7 and a 1/2 inch cake tins and place in the oven at 180 degrees Celsius for 30 minutes. In a small saucepan fill to 1 inch or less with water. Place a metal bowl on top and ensure the bottom of the bowl does not touch the water. If it does, find a smaller saucepan or use a larger bowl. Heat the water to a rapid simmer and then add the egg white into the metal bowl with the caster or granulated sugar (depending which one you're using). Mix this together with your hand until the sugar has dissolved and the temperature is about 150 degrees Fahrenheit; then remove from the heat. Place the bowl on the stand mixer, or if you're using an electric hand whisk, turn these on to high speed and whisk until the egg whites are firm and to a stiff peak. Add all of the icing sugar and mix slowly at first so you do not end up with a cloud of sugar, and then gradually turn the speed up until the mixture has no lumps in. (During this stage, add in the food colouring gel of your choice till it's your desired colour). 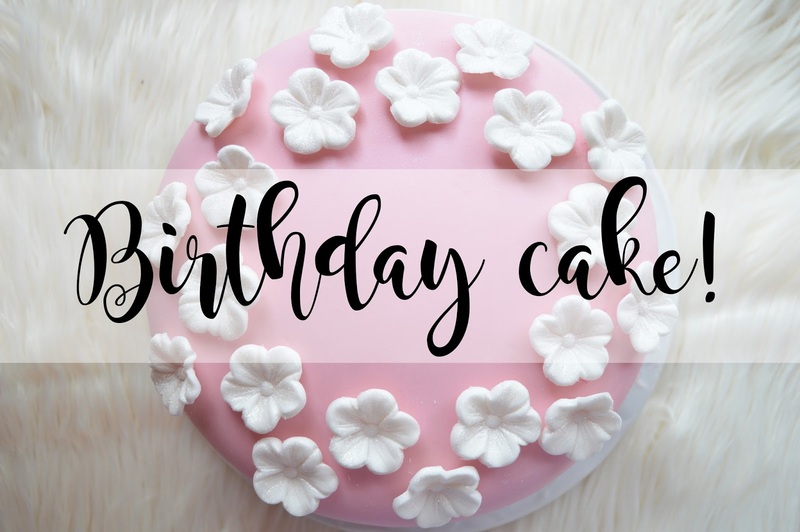 To put the cake together, spread some of the frosting onto the bottom layer of the cake until it is even and then place the next cake layer on top and press down! (By doing this, when you add the top layer of cake, the frosting will not come out and make your cakes slide). Do this for each layer until you have place the fourth layer of cake on top. Place in the fridge to cool for ten minutes. Take the cake back out of the fridge and add the rest of the frosting to the top of your cake and around the outside. This does not have to be perfect as you'll be covering the cake in fondant icing. Place back into the fridge until you have rolled out your fondant! Roll out your desired fondant to a 15 inch circle and so it is around 3-5mm thick. You will need 1kg of fondant icing to ensure this is the correct thickness and size for your cake, any less and it will not work without splitting or cracking. Once you have rolled out your fondant, take your cake out of the fridge and place it next to your fondant mat. Then hold your rolling pin above the fondant in the middle of the circle, wrap over half of the fondant. (Do not let it touch the other side!) Lift slowly and place over the top of the cake roughly in the middle. Use a fondant smoother (I don't know what they're professionally called) to smooth down the fondant on top, and then move onto the sides. Cut around the bottom with a sharp knife to remove any excess fondant. At this stage you can either put your cake back into the fridge, or you can keep it in a container which is big enough. We have a baking oven, so I place the oven in there on a plate so I know it is away from flies, dirt etc and it is still kept fresh. To create the flowers, I used flower modelling paste which you can pick up from either baking shops or some supermarkets sell it. I use a flower press (You can pick these up on ebay or baking shops online) which pushes the paste in between two moulds to create the detail of the flower. I then left these to harden and dusted some edible silver glitter over the top so they weren't plain white. I then stuck these on using water. Let me know if you create this cake! I would love to see it and let me know if you'd like to see more baking posts on my blog!